History doesn’t always come in thunderclaps or cheering crowds, and yesterday it was made with very little outward fuss when a woman in a pale blue trouser suit got to her feet from a green leather bench and began to speak. It was precisely 3.30 in the afternoon, and the Deputy Speaker of the House of Commons, Hugh Bayley, had just issued a two-word invitation: “Caroline Lucas.” And with that, the first MP of the Green Party, in fact the first MP of a new national party for many years, began her maiden speech and her party’s political life at Westminster. Henceforth, the environment has its own representation in our politics. It had been a long journey to get there, she said. Indeed it had: nearly 40 years from the Green Party’s origins as the Ecology Party in the 1970s, and nearly 20 years in the case of Ms Lucas herself, who began her rise in the party at the moment of the Greens’ false dawn: in the Euro elections of June 1989, when they got 15 per cent of the UK vote, burst on to the national political scene, and then blew it. Thrust into the spotlight, such were the antics of the Greens’ grassroots, rejecting the “cult of leadership” and insisting that the party spoke with several voices at once – I listened to the debates with an inward groan at Green Party conferences at places like Wolverhampton and Bridlington – that by the mid-1990s they had dissipated their credibility entirely and had become little better than a political joke. Caroline Lucas has led the way back to reality, and to the realisation of the truly noble aim of having a politics based on concern for the Earth, as much as on concern for equality, or freedom – the ideal of Petra Kelly of Germany’s Die Grünen, the charismatic inspiration for Green parties the world over. I have followed her long journey closely over those two subsequent decades, and many key moments are etched on my mind. There was a midnight meeting in Oxford in 1992 with a troubled Petra Kelly herself, shortly before she was murdered by her partner; a 4am moment of euphoria in Winchester Town Hall in 1999 when Ms Lucas was elected as the Greens’ first Euro MP; the moment in 2007 when she was adopted as candidate for Brighton Pavilion, the one parliamentary constituency where the Greens had a realistic chance of success; her winning of the fight for the party to have a single leader, in 2008, and then the securing of the post for herself; and finally the election night marvel at 5.45am in Brighton’s conference centre on 7 May, when she and her supporters realised that they had broken through the wall into Westminster. That was an unforgettable occasion of cheers and wild delight – in a weird way, it was like witnessing a baby being born – but somehow even that was eclipsed for me by yesterday’s event, calm, composed and routine. It was so routine, in fact, that I was the only observer in the Press Gallery, apart from two guys from Hansard, the official recorder of parliamentary debates, and a chap from the Press Association, the national news agency. There were 31 people in the public seats, and fewer than 50 MPs in the chamber. There was no roll of drums. There was no fanfare. But when this 49-year-old former Oxfam adviser got to her feet, I could not suppress my own sense of history being made; for here it was. It was real, after all, it was really happening: the voice of the environment was at last being heard in the Mother of Parliaments, long after it had resounded through every other national legislature in Europe. You had to go back several decades, she said, to the election of the first Nationalist MPs in Scotland and Wales, to find the last maiden speech from a new national political party. She went on: “And perhaps a better comparison would be those first Socialist and Independent Labour MPs, over a century ago, whose arrival was seen as a sign of coming revolution. When Keir Hardie made his maiden speech to this House, after winning the seat of West Ham South in 1892, there was an outcry, because instead of frock coat and top hat, he wore a tweed suit and a deerstalker… but what Keir Hardie stood for now seems much more mainstream: progressive taxation, votes for women, free schooling, pensions, and abolition of the House of Lords. MPs in their maiden speeches traditionally sing the praises of their constituencies, and Ms Lucas followed Tom Greatrex, singing the praises of Rutherglen and Hamilton West, and Angie Bray, lauding the virtues of Ealing Central and Acton, in making sure the Commons knew the virtues of Brighton. In fact, the bohemian bit of the Sussex seaside resort, centred on the Pavilion constituency, is the Greens’ spiritual home, and Ms Lucas hinted at this, remarking: “You have to work quite hard to be a ‘local character’ in Brighton” before going on to praise the Lanes, the Conference Centre, the Pier, the Royal Pavilion, the entrepreneurial spirit of the people, the beauty of the Sussex countryside, and the achievements of her predecessor, the Labour MP David Lepper. The House of Commons has been warned. As the Queen prepares to travel to Westminster to make her first speech setting out the coalition’s planned laws, the country’s first ever Green MP Caroline Lucas writes for Channel 4 News to describe what her alternative Queen’s Speech would look like. My government’s overriding priority is to modernise the British economy for a low-carbon future, to create an economy more balanced between manufacturing and services, more resilient in the face of financial crises, where wealth is more equitably distributed and the more vulnerable in society are offered greater protection. My government will bring forward a bill to initiate an emergency investment package, to cost £44bn, which will be intended to create over one million new jobs and training places. This investment programme will result in significant improvements to public transport, including fare reductions of up to ten per cent. It will provide free insulation for all British homes. It will transform Britain’s renewable energy sector into a world leader, which in turn will support the restoration of domestic manufacturing industry. It will also set our country firmly on the road to a zero waste economy. In parallel with this bill, my government will continue the previous government’s efforts to tackle Britain’s budget deficit by 2014, but with greater emphasis on raising tax levels on the wealthiest thirteen per cent of earners. The redistributive tax measures will ensure that a non-means-tested citizen’s pension may be introduced at the level of £170 for individual pensioners and £300 for couples. This will ensure that no British pensioner is living below the poverty line. My government will cancel new road building plans and transfer £30bn from the road building budget towards public transport and measures to promote and facilitate cycling and walking, including safe routes to school programmes. Other fiscal measures my government will bring forward will include measures to ensure that the costs of high-carbon modes of transport better reflect their costs to society. My government will introduce a bill to prevent any further private finance initiatives, and to keep the Royal Mail in public ownership, as the first step towards reversing the privatisation of public services. My government will seek effective global and European collaboration to combat climate change, in a globally equitable manner, which will involve 90 per cent cut in UK CO2 emissions from 1990 levels by 2030, starting with a ten per cent cut in the coming year and following with successive year-on-year cuts to ensure the overall target is met. My government will complete the reform of regulation of the financial services industry to ensure greater protection for savers and taxpayers, but will bring forward further legislation for the establishment of a nationwide network of not-for-profit community banks, and to separate retail from investment banking. Those banks which are wholly or partly state-owned will pay no bonuses above £25,000, and a permanent tax on bonuses will be introduced. A “Robin Hood tax”, a tax on financial transactions, will also be established. Recognising the international nature of the problems in financial services, my government will actively pursue with our European partners regulation at an EU level. My government will introduce legislation to bring about wide-ranging political and electoral reform, including a fair and inclusive voting system which will be extended to a fully-elected second chamber. My government is committed to making Britain a fairer and more inclusive society, and to this end will bring forward legislation to promote this. This will include a requirement for all companies to have at least 40 per cent of their boards of directors made up of women, and to penalise employers who implement unequal pay. The same legislation will strengthen the protection of disabled people and those with mental health problems against discrimination. My government will bring forward plans for a very early withdrawal of British forces from Afghanistan. At the same time it will seek international support for the establishment of a peace conference involving all Afghanistan’s neighbouring countries, and measures to enhance economic and political stability in Afghanistan. Legislation will be brought forward to decommission Britain’s nuclear weapons. 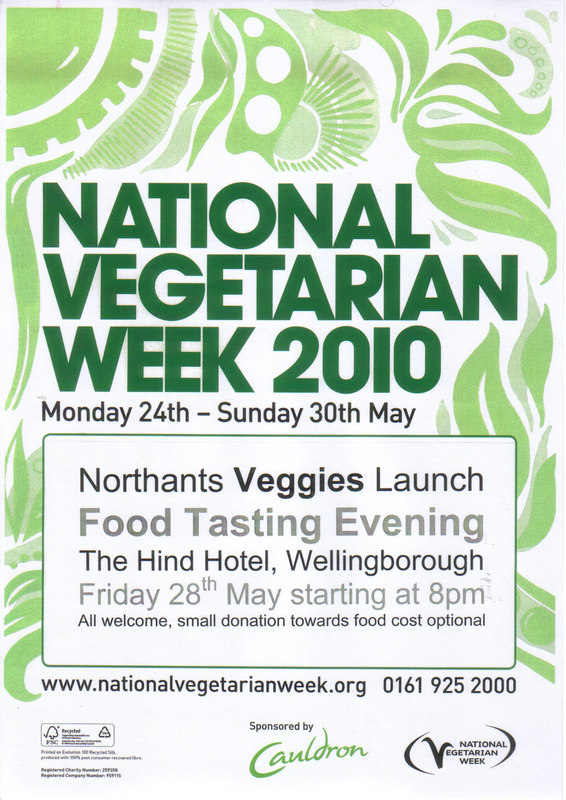 Lots of positive responses received and a great impact made in Wellingborough yesterday with the National Vegetarian Week stall. Jane Mills, John Stimpson, Emma Hornett and Jonathan Hornett handed out over 200 Northants Veggies Launch ‘Friday night event’ leaflets, plus lots of others. We took over a page full of people’s names and contact details, with many pledging that they will attend on Friday. The Launch and food tasting evening is at the Hind Hotel, Wellingborough from 8pm, we will be having an open forum on the future of the group, hopefully see you all there. How will animals fare under the new Coalition Government? So, British politics is moving into relatively uncharted territory following the election of a hung Parliament and subsequent formation of a coalition government between the Conservatives and Liberal Democrats. The Labour Party has failed to hold on to power and lost almost a hundred MPs, mainly to the Conservatives. We use the Programme for Government agreed by the coalition as a starting point for assessing the prospects for animal protection, focussing here on hunting and animal experiments. A key concern has to be the danger of a repeal of the hunt ban. The Conservatives had indicated their desire to legalise hunting and pledged to allow Parliament a free vote on hunting if they won the election. However, their failure to secure an overall majority means that it is far from certain that pro-hunt MPs outnumber anti-hunt members. Furthermore, the need to form a coalition with the generally anti-hunt Lib Dems appears to have watered down the Conservatives’ intention to allow Parliament a free vote. The Programme states: ‘We will bring forward a motion on a free vote enabling the House of Commons to express its view on the repeal of the Hunting Act’ (page 18). Many commentators* think this means that there will have to be an initial vote in Parliament to approve the tabling of a subsequent motion to repeal the hunt ban. This complicates and lengthens the process compared to the Conservatives’ pre-election position. In any case, the prospects for the hunt ban remain unclear, so compassionate citizens need to be vigilant and intensify the pressure on MPs and all the parties. In the most recent annual statistics, animal testing of household products accounted for just 132 experiments, or less than 0.000004% of the total of 3,656,080. This type of experiment seems to be naturally dying out in the UK, so this is an easy step for the Government to take. However, every animal saved from the nightmare of poisoning tests is a victory for animals and their advocates. Nevertheless, the public need to be aware that most household products on sale in the UK are made by multinationals who still use animals in crude toxicity tests for such goods. ** Progress to a ban on testing the ingredients on animals is vital, as is a prohibition on the sale of animal-tested household goods. It’s the second clause – to ‘work to reduce the use of animals in scientific research’ – which is potentially highly significant, and is similar to point 4 of our election questionnaire for candidates. The number of animal experiments in the UK has been rising steadily over the last decade, after a policy-u-turn by the Labour Government surrendered all real responsibility for animal experiments to the animal research industry itself. Essentially, the fox was left in charge of the chicken coup. The phrase ‘work to’ dilutes the promise, but it could potentially herald a fundamental change in Government approach from a passive ‘demand-led’ attitude (i.e. animals are left to the mercy of those who demand to experiment on them) to a more pro-active policy where the Government ensures that animal protection and public opinion are given serious consideration for the first time. In the past decade, the Government has ignored calls from expert advisors to develop and implement targetted reductions in animal testing. The new Coalition Government is giving us a tantalising glimpse of a new approach informed by ethics and science rather than dictated by the power and prejudice of the animal testing establishment. PAD is in discussions with animal protection organisations and senior animal advocates to save the hunt ban and persuade the Coalition Goverrnment to fulfil its promise to tackle animal experiments. In the coming weeks we will be updating this website to enable you to speak up for animals in this crucial period. We’ll also be looking at the pre-election pledges made by the new MPs so, with your vital help, we can work with compassionate Parliamentarians to advance animal protection in this intriguing political era. The League Against Cruel Sports has recently analysed the position of newly elected MPs regarding the possible repeal of the Hunting Act, based on thousands of emails and letters collected over the last twelve months. Encouragingly, it suggests that there may be a majority in the new House of Commons that is opposed to repeal. While some of this is based on speculation, as not all MPs have specified how they would vote, it is a very positive finding. Please contact your new MP and urge him or her to vote against a repeal of the Hunting Act. Even if you have already contacted them on this issue, please do so again. Now that such a vote is likely to occur, it is more important than ever to show your MP that the majority of the public are opposed to this barbaric ‘sport’. A leading Worcester Liberal Democrat has this week resigned from his position of Chair of the local group to join the Green Party. Alex Kear, who had been Councillor for the Claines ward for several years, has become the latest of many to turn their backs on the LibDems since their leader Nick Clegg and Conservative David Cameron took office. Further leading figures within the Worcester LibDem group are expected to follow Alex Kear in the next few days. Jean Lambert, the Green MEP for London, will echo calls for a fairer voting system at a mass rally demanding David Cameron and Nick Clegg hold a referendum on proportional representation in London on Saturday. The Take Back Parliament demonstration in Parliament Square, which is expected to attract thousands of supporters, will send a clear message to the Liberal Democrat/Conservative coalition government that plans for a referendum on Alternative Vote do not go far enough, and only a system of real PR will satisfy the need to empower voters. Jean, who will be one of the key speakers at the event, said: “Once again, this election demonstrated the fundamental flaws of the disproportionate first-past-the-post system. It was an election fought at the marginal seats, where the majority of voters were disempowered, and as a result we got a government that did not reflect how the electorate voted. “This must not happen again. The next General Election must be under a fair voting system. People must be free to vote positively – for what they really want. That would be real political change. The press and politicians would have you think that David Cameron’s and Nick Clegg’s arrival at 10 Downing Street means the big questions of how we do politics have been settled. No more rallies, no more protests, no more calls for fair votes now. There will be a referendum on changing the voting system – and you helped make this happen. AV may be a small step in the right direction, but it’s not a fair, proportional system. The politicians need to understand that we demand more. We want fair votes. And on Saturday they’ll hear us. Our voices still matter. We still have time, and we still have the power, to send a deafening message to the new government demanding a fair electoral system. Take Back Parliament need your help more than ever. Find an event near you now. Cameron may have struck a deal with Clegg – but he can’t strike a deal with us without PR. Last Saturday, thousands of people rallied in London to Take Back Parliament. We were live on every news programme and the politicians had no choice but to take notice. This Saturday, there will be a rally near you. Will you join in? Never before have we been able to mobilise so many people for change. We need to do it again on Saturday. Please forward this message to everyone you know who cares about fair votes and get them to join us on Saturday. Caroline Lucas, newly-elected as UK’s first Green MP and leader of the Green Party, will be attending at the House of Commons for her first official duty as a new member of parliament this morning. Around this, Caroline will available for photographs, outdoor and studio broadcast interviews and also one-to-one interviews with selected outlets. Photocall at House of Commons 1230 (exact location TBC). Outdoor broadcast interviews on request, College Green, from c. 1245. Studio interviews from 4 Millbank, some slots available from c. 1300. 1:1 interviews by negotiation, in Westminster, some slots available during the afternoon. Interviews by phone a possibility. 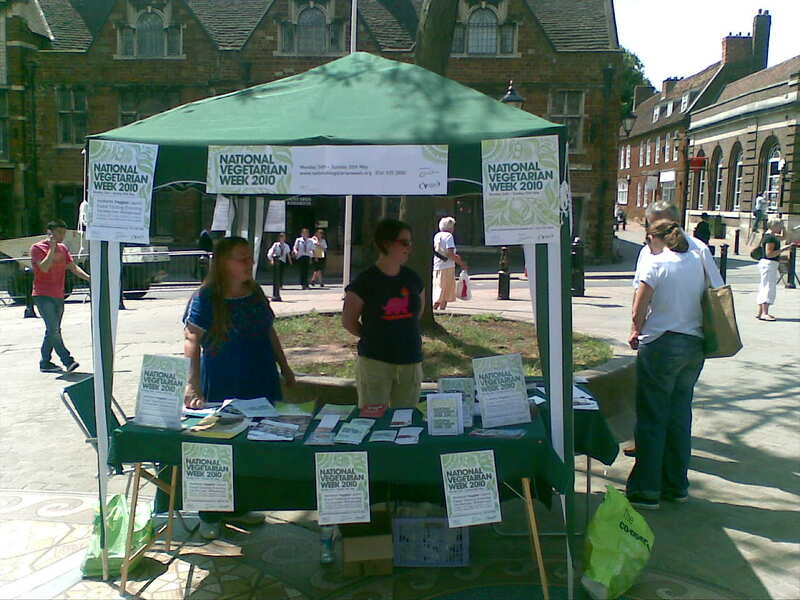 You are currently browsing the The Northants Green Party Blog blog archives for May, 2010.